We hope you had a great Thanksgiving with your family. APA has so much to be thankful for. We are blessed with an incredible staff, hard-working students, and their dedicated parents. 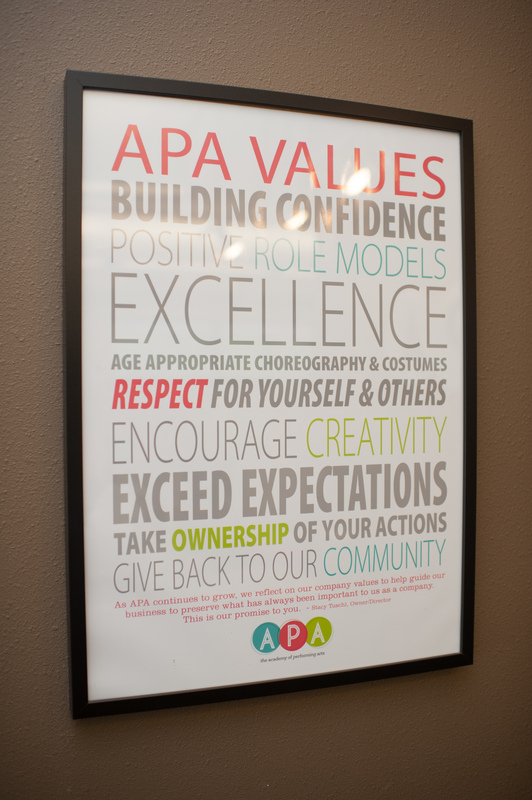 From the bottom of our hearts, thank you for choosing APA for your child’s arts education. We have such an exciting month coming up with lots of performances. Please make sure to read all of the information so you and your child are prepared for the upcoming events. We are looking forward to seeing our students perform this month! Give the Gift of Dance:  We’re excited to bring you a new way to give the gift of dance lessons to someone you know! Beginning December 3rd we will have FREE gift cards handed out inside of the classroom, or for you to grab at the front desk, and GIFT to someone who is not currently attending APA. This gift card gives them a full month of dance classes (group classes with openings only, up to $59 value) at no cost to them. All you need to do is write your name and theirs on the back of the gift card and give it to them. They can call us, stop by either location or go online to register for the dance class of their choice. *Please make sure to have them mention they have a gift card promotion. * If they choose to register after their free month and are enrolled for 2 months, you both will be eligible for the APA referral program credit! They must be enrolled by January 15th, 2019. This offer is for NEW students only. 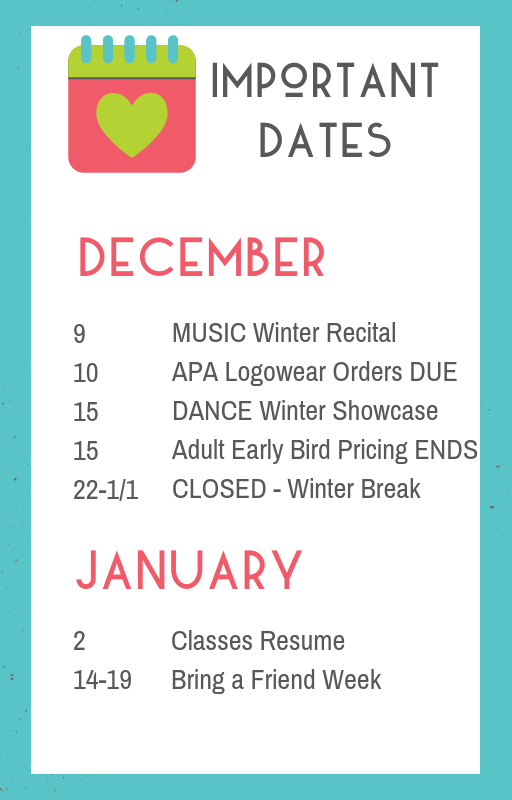 Winter Break:  APA will be closed December 22nd– January 1st. Classes will resume on Wednesday, January 2nd. For those of you that have other students enrolled in dance classes or music lessons, we will not have dance classes on December 15th, due to our Showcase performances. Music classes WILL be held that day. Snow Days:  APA will decide if we will remain open during a snow/ice storm. We use the School District’s verdict as a guideline. An email will be sent to all of our families by 3pm if we decide to close Monday-Friday or by 8am on Saturdays. We will post on Fox 6, as well as on our Facebook page. Because this is completely out of our control, we cannot provide make up lessons for each class, however, we will allow you to attend any group class the following week as a make-up. Please stop by the front desk to schedule. Cold Weather Reminder: To aid in injury prevention it is important that the dancer’s bodies are warm when they come to class. 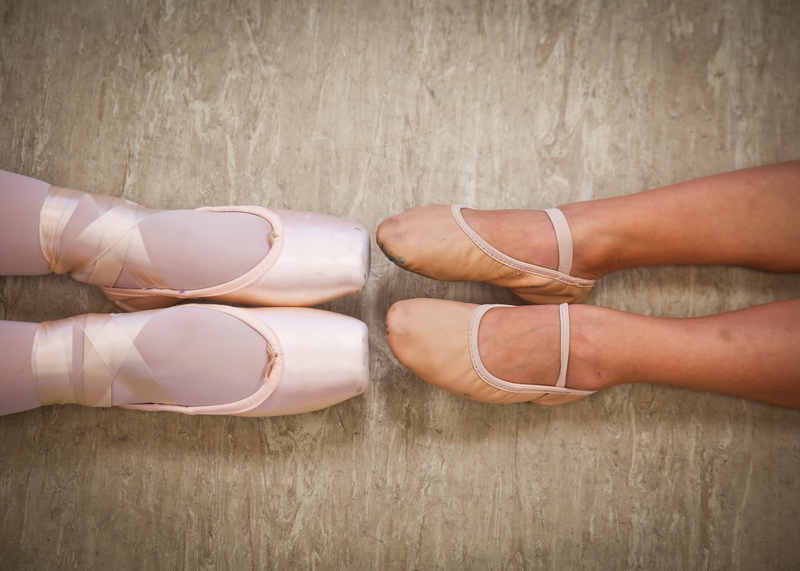 We recommend that students wear layers to and from dance class. Even though they may feel hot after dance class, it is important for their health to wear pants or leggings and a jacket. Adult Classes: Starting in January, we will continue to run another 8-week session for our Adult Hip Hop class in Franklin and our Adult Yoga class in Oak Creek. If you are interested in details, please check out www.academywi.com/adult – Early Bird registration pricing is valid until December 15th only!!! 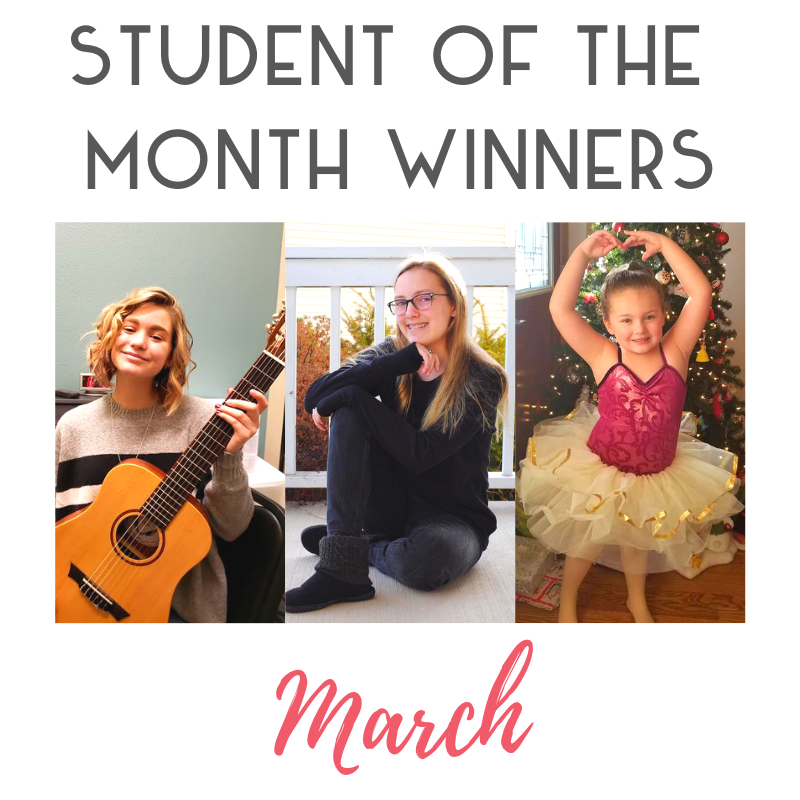 Music – Emi Suttner – Congratulations to Emi Suttner, our December Music Student of the Month! Emi is a sophomore at Franklin High School, where her favorite subject is Biology. Some of Emi’s other favorites include: color: Yellow, dessert: Schaum Torte, and food: Eggs. She also enjoys using Instagram. Her personal hero is her beautiful Mother. Emi’s favorite style of music is classical, and her favorite song is Mariya Takeuchi’s “Plastic Love”. Emi has been taking violin lessons at APA for six years. 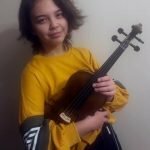 Mr. Allen says “Emi is a dedicated student and a promising young violinist. 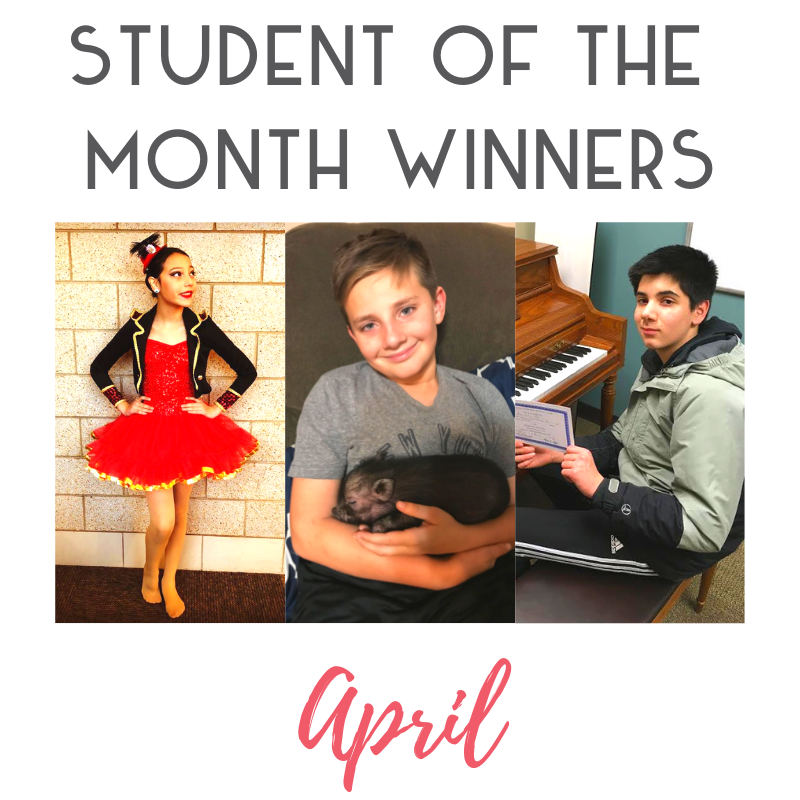 She deserves recognition as Student of the Month for consistently increasing her level of ability as she tackles challenging repertoire.” Congratulations, Emi! 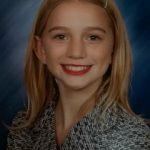 Recreational Dancer – Jayla Richter – Congratulations to Jayla Richter, our Recreational Dancer of the Month. Jayla is in 5th grade at Carollton Elementary School, where her favorite subject is Math. Her favorite food is Lasagna and her favorite dessert is a Banana Split. Jayla would like to be an actress or candy maker when she grows up. Her personal hero is God. Jayla loves the color yellow. Her favorite song is Lucid Dreams and she enjoys using the app Sandbox. Jayla has been dancing with APA for 7 years, her favorite style of dance is Hip Hop. Her favorite memory is performing “Can I Take Your Order” at the Showstopper Dance competition 2 years ago. Miss K says Jayla comes to class with a positive attitude and is open to learning new moves even if she doesn’t understand the choreography initially. She is a very energetic and hardworking dancer. Jayla also became an assistant and helps out other students with the movements throughout class. She’s always smiling and spreading her contagious bright energy! Congratulations Jayla! Competitive Dancer – Kyla Bartsch – Congratulations to Kyla, our Team Dancer of the Month. Kyla is in 2nd grade at Meadowview Elementary school where she enjoys Writing and Art. Her favorite color is Turquoise, her favorite food is Spaghetti and her favorite dessert is Cheesecake. Kyla’s favorite songs are Champion and Blown Away by Carrie Underwood. Her heroes are her Mom and Dad because “they work really hard so I can dance so much.” Kyla has been dancing for 5 1/2 years and has been on APA Teams for 3 years. Her favorite styles of dance are Tap and Ballet. Her best dance memory is “going to the Showstoppers convention at the Kalahari because all my teachers and friends were there and we had so much fun dancing together.” Dance has taught Kyla “how important it is to be a part of a team and it has showed me to never give up.” Miss Jessie says Kyla is always quiet and focused in her classes. She’s eager to learn more and I enjoy watching her grow into a young dancer. She practices her dances and sets a good example for her teammates. I can’t wait to see what the future holds for Kyla. Congratulations Kyla! Winter MUSIC Performance: Our winter music recital will be held at the Oak Creek Salvation Army on Sunday, December 9th starting at 1pm, 2pm, 3pm, 4pm, 5pm or 6pm. We are currently collecting song selections from students & teachers and then will assign the students their performance time. Please check your email for our performance line-up on Monday, December 3rd. The Oak Creek Salvation Army is located at 8853 S. Howell Ave. This is a beautiful space that seats up to 400 people. This is a free event for students and any friends or family! Please feel free to invite as many guests as you would like. Each act will be about 1 hour. Please have students dress in formal attire, no jeans! License Plate Winner: Congrats to license plate 292-WKA! One of our staff members spotted your APA window sticker while driving! Please contact the front desk so we know who you are and you will receive a $50 tuition credit. To participate, grab a FREE window sticker at the desk! Facebook & Instagram:   Interact with APA on social media! We have fun contests, photos from classes and more on both our Facebook and Instagram pages. Click here to join us on Facebook and here to follow us on Instagram! Logo Wear for Sale: You can place orders from our online store from the 1st-10th of each month. We do not have these items available at the studio. All orders will take 3-4 weeks after the store closing date and will be shipped for free to APA. We will notify you when your items are available for pick-up. Click here to order! Tickets: Tickets are going fast for our December performances! Please visit the South Milwaukee PAC online to purchase your tickets – Click here. Our 3:30pm show is sold out. IF your student is in this show and you have not already purchased tickets, please call or email APA to join our waitlist. We have already cleared seats for our current waitlist people. IF you have extra tickets available for the 3:30pm show for us to purchase back from you, please let us know. Volunteers: We are looking for parent volunteers to sit backstage with each 1st grade and younger class. Please sign up at the front desk. You will be able to watch your child dance. Dress Rehearsal: There is no formal dress rehearsal for our December Showcase. Arrival Time: Students are to arrive 30 minutes early. Their teachers and APA staff will make sure their costume/hair are correct. Music: Recreational classes can request to have their music sent to them so they can practice at home. Please email us at [email protected] and we will send you a digital file. Complete Winter Show details including UPDATED show times, line ups, ticket sale information, hair and make-up click here.